This is a highly entertaining, 60 minutes film about the greatest pulling mishaps, happened the last 25 years on the tracks. You will see all the fires, engine-explosions, high wheel stands, breakdowns and rollovers. "Never before seen" film material with original sound, slow-motions and backgrounded with good music. 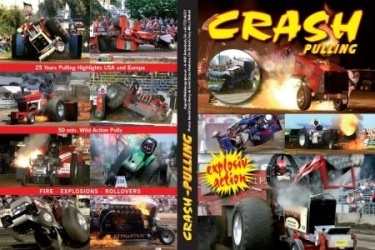 Hundreds of different pulling crashes filmed on the European and American pulling tracks. This is breathtaking pulling excitement, where nobody was hurt, as Tractor Pulling is one of the safest motor sports.